As an investigative journalist, broadcast journalist, French-German author of several books since 1984 I am for about 24 years performing a research how we might challenge these big media companies and networks and the big media. For hours I had conversations with editors in chief and even with some of the media moguls until I have realized there are three easy steps how to challenge the big media and the media moguls. 2.STEP TWO: Simply turn off ABC, NBC, Fox News and Ted Turner´s CNN and switch to Democracy NOW! with Amy Goodman and Juan Gonzalez. Democracy NOW! is available worldwide on 250 radio station and about 700 alternative television network station and even on satellite television. You will find the current information where to watch the educational television and radio program on www.democracynow.org . You will have the great chance to see and to hear the difference in the media. It is almost like you as have spend 40 years in the wilderness and have been looking for a good well (water source) . There you will find fresh and clean water and just with watching one hour Democracy NOW! you will be able to experience the great joy not to thirst this quick again for a good and educational television and radio program. You will realize also that you do not have to spend hours watching television all the day long and to waste your precious time. After watching one hour Democracy NOW! you will have more time for valuable things which do matter in your life. You could easily spend some time getting engaged with some social work in your local community or you might have even more time to spend with your friends and family. Picture this: It is by no means only Ted Turner and other media moguls which do have the power and strength to challenge you. IT IS YOU, which can challenge the big media and the main stream media moguls. Imagine, if only 90 or 100 million people will follow the advise to turn off the big media and to tune in to Democracy NOW! or other alternative radio and television programs. The big media would feel this by loosing millions of advertising money for commercials and infomercials. Guess if you continue for one week or even longer. The media moguls would start to think and perhaps after some while you would realize that every listener and viewer has so easily the strength and power to challenge and even to change the big media. Think as independent as possible. You need to think ! And then act with peace and wisdom. With every listener and viewer which the big media is going to loose, the big media will loose its power. This concept is working very well with newspapers also. Imagine the newspaper is not covering the stories you want and need to read. Just give them a friendly call to the publishing house and let them know: “I am not going to buy and read your paper anymore as long as I will find the stories which I can not find at this time in the paper.” You can challenge the editors and publishers and you will be able to witness and read the change. Step number 4 is not this easy. 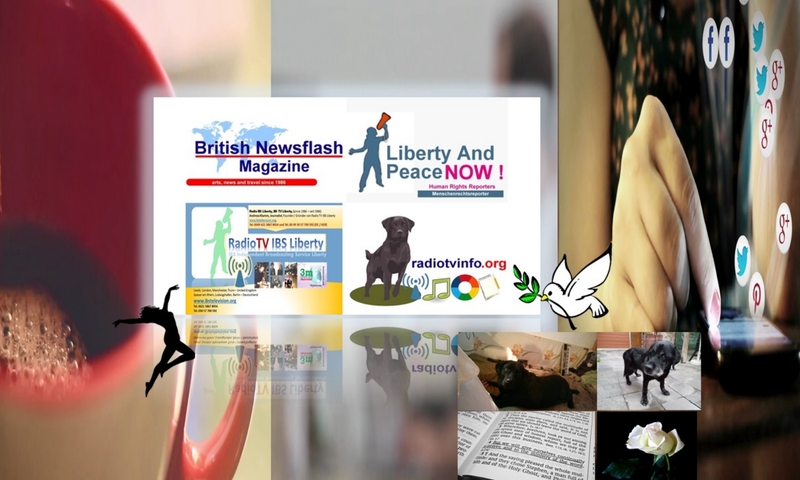 In 1986 I became the founder of the international alternative media network IBS Independent Broadcasting Service Liberty, IBS Television Liberty and Radio IBS Liberty. You should know that my father was a poor fire fighter, my grand father was a French Army Officer stationed in Germany in 1945. In 1986 I have started with about 100 German Marks with the foundation an own and international alternative media network. This will require if you are not rich and have not the money that you will love to work and labor hard. There are ways to cover huge events such as the G8 summit in Heilgendamm Germany even with only 20 U.S. Dollars in your pocket. In 2007 I did this: I have been one of about 4.700 officially registered journalists, news correspondents and television producers with an accreditation issued by the German government. Before I became one, I had to write to two German courts and some viewers, listeners and readers have signed a petition that I will get with my official press credentials the permission to produce independent television and radio programs. It has required some work and fights to defend the freedom of the press and information. Therefore as you are able to imagine I do know what I am writing and talking about. It will be not an easy way. Since 1984 I have produced hundreds of television and radio programs and I have conducted hundreds of interviews have been taking about 20.000 photographs as a photo journalist and have received the first awards when I have been 18 years of age in 1986, 1987, 1988 and 1989 from a state film department in Germany. In the studio and the editorial offices I have spend hours, day and nights even covering the U.S. elections in 2000 and 2004 and in some cases I have been spending about 18 up to 20 hours in the studio to cut and edit radio and television programs. It was certainly in many cases hard labor and it will require some sacrifices if you are willing to build your own international media network. If you ever will perform 2 hours Live television programs and 8 hours Live radio programs you will certainly know what I am writing and talking about. In the past 24 years I had the chance to meet so many precious people, even some precious politicians and other journalists and I do not want to miss these interesting conversations. My advise is that you should consider the price which you will have to pay by spending a lot of your precious time of life if you are planning to run an alternative television and radio program. There are many other books on the market which you could and should read also. If you have because of the financial crisis not the money anymore to buy some real good books, spend some time in your community library as I did already in 1987 in Leeds in the United Kingdom and in many other cases in Germany and even in New York City in the United States of America. If you are planning to work as an investigative broadcast journalist, journalist and author you should be prepared for fights such as death threats, attempted targeted killing and threats. In Germany in many cases some people and political forces try not to shoot journalists but to destroy their financial liberty which is making everyone this easily a slave. Sometimes it occurs that you will receive first threats, followed by death threats and that you will get involved as a victim in so called “accidents”. Some viewers and observers have told me, that some of the accidents which I have suffered have been not accidents but the attempt to kill me for covering simply stories about the abuses of the human rights, political, social and financial affairs. It is a serious thing if you are going to receive threats. Not taking part in the fight could mean that you have lost the fight or the battle already. However I do believe: If the good people are NOT fighting, the bad guys or people will win. And these times are so special that I do believe that we just can not allow and afford the luxury that the bad people which do oppress the truth and millions of people that the bad people will win the battle or the fights. Therefore the good people have to fight for peace, liberty, justice, truth and democracy – every one of us. Peace, liberty, justice, truth, social security and democracy are under attack and every one of us should take part in defending these elementary and fundamental rights. This will be certainly not without danger. I do know that liberty is right and GOD gave us not a free will to be slaves. God teaches liberty. Do fight as peaceful as possible, not with violence, overcome evil with good, overcome violence with non-violence. There are many peaceful ways how to fight and how to defend. Even if you might get famous, known in many different countries in this world PLEASE keep in mind, that our listeners and viewers deserve the THANKSGIVING. One of our websites has visitors and readers from 40 different countries. We had not one single cent on our budget for 2007 and 2008 for advertising to tell other people about this new service which has started in May 2008. Thank you to the listeners and viewers and for your tips and guidance which has challenged in Germany sometimes even the big commercial main stream media and even the powerful state operated television and radio stations in Germany. However I know God is watching and listening us at any time and this comforts me, perhaps other people, too. There is no secret which you can hide before the Lord our God. This truth and fact might scare some people while this truth and fact is a comfort to me and many other people. Some viewers have been wondering what the term “Journalist, D.o.G.” stands for during some of my television programs and perhaps they might have been thinking I am working for the Department of Germany. This is not the case, I am still working international and alternative. Some times I do wonder if some one wants to tell others about the truth how in the world we are able to deny the most important truth? The answer and truth is very simple: “D.o.G. Stands for dependent upon the GRACE OF GOD.” All truth shall be revealed. Best wishes.